“I never knew that writing on Amaechi as a man ahead of his time can be this tasking and assiduous. I have tried to x-ray this enigma in this regard on the areas of his feats as the first Nigerian to assume office as a State Governor in Nigeria while on self exile and the only Nigerian to have been a two time Speaker of Rivers State House of Assembly and chairman, Conference of Speakers of State Houses of Assembly in Nigeria. Two-time Governor of Rivers State for eight years and two- time chairman, Governors’ Forum a feat not common in any country and yet these seem not to be enough in presenting him as a man ahead of his time. I have tried in part one of this treatise to present how this man succeeded in making Port Harcourt the Book Festival and UNESCO World Book capital City for the year 2014, making her the 14th city in the world to be selected as World Book Capital and the first in Black Africa beating 10 other great cities that include Oxford in England and Moscow in Russia. I have tried to assess the feats of this uncommon transformer as the only Nigerian leader to have initiated the setting up of one of the largest metropolitan areas in Nigeria when he embarked upon the construction of the Greater Port Harcourt City covering about eight local Government Areas of Rivers State; still it seems I have not started to write on what made this man to be a man ahead of his time. Having dealt with his feats in the areas of education revolution, the sewage challenge in Rivers State and how he plotted the unseating of a sitting and very powerful President in Africa, Dr. Goodluck Jonathan of PDP with all the powers of incumbency, NNPC, CBN, INEC, highly rated corrupt Political and Religious leaders with all the Security organs/apparatus in his pocket, yet people are still asking me if Amaechi truly is a man ahead of his time…” – EZE. Since the publication of the first part of this treatise, which I entitled, Amaechi: The Man Ahead Of His Time And His Audacity (1), that took the world by storm, I have not rested. There had been numerous e-mails, text messages, phone-calls from people who read the first segment of this epochal treatise, pleading for the concluding part of this insightful article that truly exposed the vision, feats, mission and true nature of Rt. Hon Chibuike Rotimi Amaechi, CON; erstwhile governor of Rivers State and incumbent Minister of Transportation. Most importantly, this great son of Nigeria, whose love and zeal for his fatherland is legendary, is a man noted for his honesty, visionary, egalitarianism, radicalism, boldness, fearlessness, pragmatism, inventiveness, ingenuity, respected, loved and only hated by those who doesn’t like his principles and high-level reasoning and operation that on many occasions defies human logic and understanding. To most of his admirers, he is accepted as the Lion of Niger Delta Politics. In my reply to Uzomah, I apologised to him and others for the delay in releasing the second part of this treatise. I confessed to him that writing on Amaechi not only gives me a lot of joy, but I must be on top of my game to do the type of job expected on such an ‘institution.’ In fulfilment of this pledge, I hereby release to the public the second section of this treatise, which I know will put Amaechi in the class of leaders where he rightly belongs. In my reply to this great mind, I thanked him for finding time to read my opinion on what made Amaechi to be a man ahead of his time and assured Wehere that I am not running down Wike, only that he has tasked himself to mis-present facts on CRA and that places on me the task to present the facts the way it was/is, for the public to judge. Though, what Wehere and others that share his opinion that I am running down Governor Wike, do not know is that Governor Wike is my close friend and associate. In short, his love for me is overwhelming that made him to recommend me for various high positions during the tenure of Amaechi as governor of Rivers State. This, notwithstanding, one of my principles in life is to guide against injustice and protect the just, which is why I align with Amaechi in this struggle, knowing that Wike is vilifying him unjustly. This position was rightly captured by Nsirimovu, another great mind from Rivers State, a notable social critic and publisher in his reaction. He stated: “Eze, that is wonderful! Good one for the records. The reaction that made me to cry was the text from Pastor John Soberekon a respected man of God from Rivers State and according to him, “Chief, Man can not reward all the efforts you are putting into the course you believe in. Only God can repay you and I am sure that He will. He that said that “the labourer is worthy of his wages” cannot do otherwise. Keep doing it Sir, we support and pray for you”. Pst John. I don’t know what else to say but to appeal to all those who are chanced to read this treatise to assist me to ensure that the feats of Amaechi are not destroyed because of politics. Before, I go further; let me highlight some of the key areas I postulated in the first part of this attempt to enable new readers of this to have a true grip of the issues at hand. I stated that what led to my embarking upon this study and expository was the gathering of the political associates of Amaechi under the auspices of the Conscious Reformers Assembly (CRA), in collaboration with some other associations in Port Harcourt on June 17, 2017 to honour Amaechi on his 52nd birthday lecture/symposium, entitled Amaechi: The Man Ahead of His Times. But, not minding the efforts of both the organisers, the great views postulated by the guest speakers, their views and positions were neither properly and widely published as expected of such a great event, and as one of the authorities on Rivers State politics, particularly with biasness on the issue of who Amaechi truly is, I have to attempt to unmask and present to the world the issues that actually make Amaechi ‘a man ahead of his time’ in the proper perspective, which warranted this treatise. This attempt also was to correct the erroneous impression being put across, mostly by Peoples Democratic Party (PDP) chieftains, with Rivers State Governor, Nyesom Wike, as the major culprit; that Amaechi’s eight years as governor of Rivers State was totally a waste. In the first part of the treatise, I stated that the names of this man who rose from obscurity and state-imposed persecutions to limelight played significant roles in shaping his political fortunes. I stated that Chibuike, which means ‘God is all Powerful’and Rotimi, an abridged version of Oluwadurotimi, meaning ‘the Lord stands by me’, while Amaechi means ‘who knows tomorrow? Amaechi’s creation of the Port Harcourt Mega City, to decongest the city and building of one of the best modern stadiums and other edifices only obtainable in modern cities of Europe, placed him truly as a man ahead of his time. Amaechi’s Greater Port Harcourt was to spread to eight local government areas, including Port Harcourt, Okrika, Obio-Akpor, Ikwerre, Oyigbo, Ogu-Bolo, Etche and Eleme with total population estimated at 2,000,000 as at 2009, making it one of the largest metropolitan areas in Nigeria. Port Harcourt – the capital of Rivers State of Nigeria, under the watch of Amaechi – was declared World Book Capital City 2014. UNESCO moved by the revolutionary feats of Amaechi in the education sector, crowned Port Harcourt the 2014 World Book Capital City in April 2014, beating 10 other great cities that include Oxford in England and Moscow in Russia. For this to be achieved against all odds and challenges simply demonstrates that Amaechi was a visionary and focused leader who has received accolades in this regard by world leaders. After due clearance from the Holy Spirit who authors most of my write-ups, it gives me a lot of joy to present before you my friends, brothers, sisters and associates, the second segment of this treatise: Amaechi: The Man Ahead Of His Time And His Audacity (2). At this juncture, it becomes imperative to highlight some of the other sections that placed this great revolutionist as a man ahead of his time. Late Emperor Haile Selassie of Ethiopia’s famous words: “Throughout history, it has been the inaction of those who could have acted, the indifference of those who should have known better, the silence of the voice of justice when it mattered most that has made it possible for evil to triumph.” It is in fear of this truism that made Amaechi to defer the norms and even the security of his life when he decided to lead the removal of a sitting President who has all the powers to do and undo so far the politics of Nigeria is concern. When on 9th September, 2013 my appointment as the National Publicity Secretary of the New PDP was announced to Nigerians the only brief I received was the 30 minutes encounter I had with this enigma they call Rt. Hon. 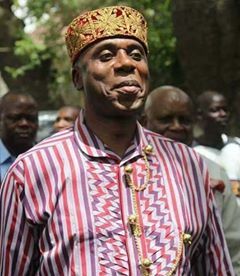 Chibuike Rotimi Amaechi. During that encounter he kept repeating that whenever General Muhammadu Buhari (rtd.) accept to fly the flag of the emergent mega opposition political party in the country, the unseating of President Goodluck Jonathan and PDP would become a reality. I was deeply impressed by his strong belief in General Buhari. It was based on this that I went boldly into the field and with the cooperation of the G7 Governors and other leaders of the New PDP then, we were able to dismantle what was the famous and largest political party in Africa. At the time five out of the seven Governors joined APC formally and during the APC Convention, Amaechi and with the help of others, General Buhari was duly elected as the flag bearer of APC. In appreciation of his key role in making Buhari the Presidential Candidate, he was duly appointed to head the Campaign of Buhari and his feat in ensuring that Buhari was duly elected as the President of Nigeria will forever resonate in the country’s history. Many people may not appreciate the risk; this enigma of a man took in salvaging Nigeria from the hands of looters whose intention was to loot the common patrimony of our nation with impunity. With the high level of corruption exposed by most of the key actors in Jonathan’s administration, Rt. Hon. Chibuike Rotimi Amaechi need to be celebrated almost on daily basis as a man that truly is ahead of his time. According to Dr. Ogu Emejuru, Amaechi’s SA on Environmental Health during Amaechi’s tenure as Rivers State Governor in a text to me appropriately captured how Amaechi handled the sewage challenge in Rivers State in these words, “Chief Eze, in your efforts to educate the world on some of the feats of Rt. Hon. Chibuike Rotimi Amaechi erstwhile Governor of Rivers State and incumbent Minister of Transportation, I have to remind you NEVER to forget the 1.3 billion Naira Sewage and Biogas plant that was built in Eagle Island. The plant one of its kind in the country and produced fertilizer and biogas used to power the premises. We processed more than 40 trucks of sewage daily. In fact we worked very closely with the Port Harcourt sewage association they clamored for more plants to be situated in other parts of the State. This plant was commissioned with fanfare amongst the Eagle Island community by the great late G. U. Ake just before the election in the presence of the former Commissioner of Water Resources who was very instrumental in founding the Port Harcourt Water Corporation. Amaechi had a vision for a clean environment and part of that vision was trusting me and asking me to establish that plant. In fact the World Bank made several visits to the plant and actually is using it as a template for further work in the state to establish more plants. The plant is now an important asset of the Port Harcourt Water Corporation in Rumuola. As with all things in our politics, I get reports that the plant has almost broken down completely to the disappointment of World Bank officials who visited there weeks ago. Amaechi was an ENVIRONMENTALIST and as a paediatrician, I understand the importance of a clean environment in the health of our vulnerable children. We should not forget that part of Governor Amaechi’s legacy”. If this doesn’t demonstrate a man ahead of his time then I do wonder what exactly we are talking about. On assumption of office in 2007, the Amaechi-led government declared a state of emergency on the education sector and completely took over the payment of salaries of primary school and junior secondary school teachers, hitherto the statuary function of local governments, to ensure that education takes its rightful place in the scheme of things. This intervention cost the state government N800 million monthly, to pay salaries of primary school teachers. To further strengthen and ensure qualitative education in the state, ex-governor Amaechi signed into law five bills brought for his assent by the State House of Assembly. Among them are the Rivers State Universal Basic Education Amendment Bill 2012 and the Rivers State Senior Secondary Schools’ Board Bill 2012. The then governor was upbeat while signing into law these bills, including the one on social services levy recently passed by the Rivers State House of Assembly. The government targeted building 700 model primary schools with 350 completed – each with 20 classrooms costing about N116 million each and equipped with ICT facility, modern library, science laboratory, football field, basketball pitch, volleyball pitch and nursery playground. These model primary schools were built to the standard of the United Nations as obtainable in developed parts of the world. Another giant step taken by the Amaechi administration in the educational development of Rivers State was the construction of new 20-classroom blocks’ model primary school, to commemorate the status of Port Harcourt as the current World Book Capital. Known as World Capital City Model Primary School, the edifice is located in Port Harcourt Township and was already furnished and operational with commencement of classes for the 2014/2015 school year. In addition to classrooms and teachers’ offices, the model school is equipped with state-of-the-art facilities like demonstration science laboratory, library, ICT, sick-bays and reception class. The former commissioner of education, Barr Alice Lawrence-Nemi stated that construction of the 20-classroom blocks was necessitated to address the issue of out-of-school children in the state. The state government embarked on this project to ensure that every child in the state has easy access to the free education policy of the Amaechi-led administration. The project is in line with the Education for All (EFA) and Millennium Development Goals (MDGs) vision of providing access to all children of school age by the year 2015. Samples of the 20-classroom blocks are built in all the 23 local government areas of the state, which include demonstration science laboratories aimed at giving children the opportunity to visualise what they are being taught in class. The introduction of laboratories is in line with the new national curriculum, which allows children from four years and above to be exposed to science education early so as to better understand science courses in the future. The demonstration class is where the teacher demonstrates for the pupils what they are learning. It makes teaching and learning easier for the teacher and the pupils. “Also Home Economics will be demonstrated in the Lab. The essence is to teach the pupils the basic ways of cooking, personal hygiene and general home-keeping. The schools are well equipped with books and e-books. The State Government is using the medium to promote reading culture among pupils and students. Every school has reading period and pupils are made to pick a book. Each pupil will summarise the book during book reviews at the end of the period. Throwing more light on his feats in the educational sector of the State, Amaechi stated, “our educational system witnessed transformation in infrastructure and service delivery. Although constrained by the reduction of our revenue by more than half, our administration is proud of undeniable successes in our educational sector such as infrastructure revolution: Building and equipping over 311 world class primary schools and five model secondary schools; The retraining and recertification of teachers with the involvement of the British Council in Port Harcourt; Total elimination of strikes and disruptions by takeover of payment of salaries of primary school teachers amounting to about N2bn per month; Recruitment of 13,210 teachers; Establishment of the Quality Assurance Agency; Introduction of Free Education up to secondary school level; Abolition of all fees in schools; Annual oversees scholarships in strategic branches of knowledge; Establishment of skills acquisition institutions to draw attention to self-employment and entrepreneurship; and above all, the outsourcing of management of schools in the state. The icing on the cake perhaps is the transformation of the UST from 79th to best state university in Nigeria and 12th over all best. There is also the establishment of a university of education. As part of the Administration’s deliberate academic growth policy, we sent our children to schools overseas, while working on improving our facilities in the state. Back home, we sent others to rated secondary schools and universities. We are proud of our achievements in the education sector; and are equally proud of our children who proved that given conducive locale, they could compete with the world’s best and brightest. We have given over 3000 scholarships to our deserving children within and outside the country. Even with mounting pressure and competing interests made the education of our children a priority as indeed it should be. N800,000 ( Eight hundred million Naira) has been released to the Rivers State Sustainable Development Agency in this light to enable it pay down some of its obligations to our scholars. Dr. Samuel Jonah Abbey one of the beneficiaries of Amaechi’s policy on education wrote and I quote, “It is with a deep sense of gratitude and appreciation that I write to humbly say thank you for making me what I am today. The background story might be too long for you to read Sir, considering your busy schedule. Sir, I had lots of aspirations as a child but the demise of my parents almost crumbled the skyline of my world. As an orphan, I completed my first degree in Civil engineering with upper class in 2010 at the University of Portharcourt. My horizons were then broadened when I heard about your overseas scholarship scheme during your term as the executive governor of Rivers state. Sir, the transparency of your administration gave me the opportunity to be assessed and awarded the RSSDA scholarship on merit to pursue MSc Civil Engineering in the UK. I successfully completed my MSc with Distinction in 2013 and today your Excellency Sir, I have completed my PhD in Civil Engineering, Coventry University, UK and now addressed as Dr. Samuel Jonah Abbey. Sadly, Governor Nyesom Wike the incumbent Governor of Rivers State not only stopped the scholarship scheme of the Amaechi’s administration, sacked the 13,250 Teachers employed by Amaechi and discarded all the great schools built by the Amaechi’s administration. He has so destroyed education in Rivers State that he has embarked upon vendetta against all the owners of private schools in Rivers State that over 1,500 private schools have been marked out for demolition in the State. I never knew that writing on Amaechi as a man ahead of his time can be this tasking and assiduous. I have tried to x-ray this enigma in this regard on the areas of his feats as the first Nigerian to assume office as a State Governor in Nigeria while on self exile and the only Nigerian to have been a two time Speaker of Rivers State House of Assembly and chairman, Conference of Speakers of State Houses of Assembly in Nigeria. Two-time Governor of Rivers State for eight years and two- time chairman, Governors’ Forum a feat not common in any country and yet these seem not to be enough in presenting him as a man ahead of his time. I have tried to assess the feats of this uncommon transformer as the only Nigerian leader to have initiated the setting up of one of the largest metropolitan areas in Nigeria when he embarked upon the construction of the Greater Port Harcourt City covering about eight local Government Areas of Rivers State; still it seems I have not started to write on what made this man to be a man ahead of his time. Having dealt with his feats in the areas of education revolution, the sewage challenge in Rivers State and how he plotted the unseating of a sitting and very powerful President in Africa, Dr. Goodluck Jonathan of PDP with all the powers of incumbency, NNPC, CBN, INEC, highly rated corrupt Political and Religious leaders with all the Security organs/apparatus in his pocket, yet people are still asking me if Amaechi truly is a man ahead of his time. Yes, you may say that I have nothing else to write but wait for the part three of this treatise that will deal on how this man curbed insecurity in Rivers State and for a whole year in 2010 there was no single armed robbery incident in Rivers State, as a foresighted man, he imitated the Monorail magic in Nigeria, his feats in the Agricultural, health sectors, his prudent management of public finance and how he managed to survive the onslaught of Dr Jonathan, Dame Patience Jonathan, Joseph Mbu then Rivers State Commissioner of Police, Nyesom Wike and Federal Government agencies and you can then tell me if Amaechi is or not a man ahead of his time.